Creative Universe and Ci2013 are proud to support Creativity Australia. Creativity Australia is a not-for-profit organisation that inspires people to find their voice. The organisation uses creative programs that result in positive social and economic outcomes for individuals, organisations and communities. 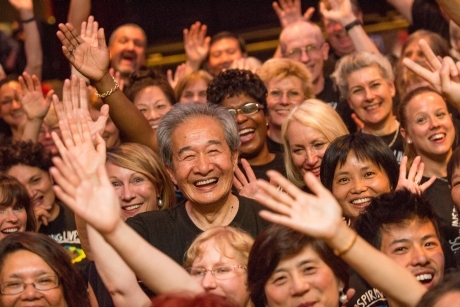 Creativity Australia’s acclaimed With One Voice choir social inclusion and community well-being programs aim to recognise each unique voice. The choir programs are unique in that they deliberately build and bridge social capital. They bring together people of all ages and from all walks of life, cutting across socio-economic, cultural, religious, generational and linguistic barriers in the pursuit of harmony. The program deliberately brings together migrants, the unemployed, those with disabilities and disadvantage, and general citizens and workers seeking to unlock their creative potential and make a difference. The programs build bridges of understanding across all areas of society…from asylum seekers to CEOs of organisations. The choirs which rehearse weekly with a professional choir leader provide important opportunities to develop networks for friendship, belonging and employment. Participants develop leadership potential, build self esteem, communication and creative skills. They also learn how to work as a team and perform at special events and festivals. When many diverse voices come together as “one voice” on a regular basis, the outcomes are transformational. This has already led to members gaining employment through improved self esteem, contacts and skills developed through the programs. In just over four years fifteen With One Voice choir programs have been developed involving hundreds of participants in Victoria and NSW. These diversity choirs have in turn reached out to thousands of people with their moving stories and inspirational performances. Plans are underway for programs in other parts of Australia. This is only possible through the generosity of donors and partners. We welcome your support of this transformational program.